CC Pace recently completed an interesting project for a mortgage lender who had just done an acquisition. The project questioned a fundamental assumption of loan pricing and whether the existing approach was compliant or not. One entity had “branch” pricing (as do many lenders), where the price quoted to the borrower is based on the branch rate sheet of the loan officer that the borrower works with. The second entity, however, had pricing based on where the property was located (also a common practice). Compliance recognized that these two different methodologies could result in disparate pricing to the consumer, potentially leading to fair lending violations. Having been in the industry for a long time, the notation of pricing based on the loan officer’s rate sheet didn’t seem unusual to me. We have implemented this model many times, going back to the 1980’s. It was so ingrained that I had never really thought about it. But this project challenged my assumptions and changed my way of thinking—for the better. In retrospect, under the “right” (wrong?) use cases the lender could have faced fair lending penalties even before the acquisition. For example, if a borrower was looking for loan for a second home and had gotten quotes from both their local branch and from the branch in the property’s geography, those quotes could easily have been different. Our client’s Compliance group recommended moving everyone to the geographic model – pricing based on where the property is located, not based on where the loan officer is located. And pricing should include “junk” fees, which were determined by the Sales organization, whereas Secondary determined rates & points. CC Pace’s role was to lead this transition, a major shift for a lender who hadn’t re-thought their pricing in many years. Redesigning processes that were deeply ingrained in the organization and systems made for an interesting project. How do you define the geographies? Zip code level is too small to be compliant; MSA is better. But using every MSA in your footprint may be too many geographies to maintain. How do you align the “junk” fees with the geography and with the organization? Who actually sets the branch rates? What updates do you need to make to your rate sheet? What new training do you need to do? Much of the elapsed time for the project was spent in the conceptual design and getting it approved by the stakeholders and Compliance. However, the bulk of the man-hours were spent updating and testing the pricing engine and loan origination system for both pricing and fees, and then testing the systems across all the different use cases (retail, call center, digital). There was also a need for some organizational realignment of responsibilities. Surprisingly, however, the re-training of loan officers turned out not to be very difficult. I came away from this experience realizing that this was an important project that many lenders may need to consider, even if they are not doing an acquisition. How does your organization price loans? Although Charles Darwin adopted the term “Survival of the Fittest” from Herbert Spencer to describe his theory of evolution, it is easy to misunderstand if you don’t have context for what “fittest” means. Darwin’s theory of natural selection showed how, in the long run, organisms that could adapt to changes in their environment out-survived organisms that were highly efficient in the current environment but rigid, and slow to adapt. How is this relevant to loan origination? Few industries exist in an environment that changes as frequently as that of mortgage banking. Many lenders with what they believe to be a highly-efficient process seek to memorialize that process in their loan origination systems (LOS) through customization – only to find that when they need to upgrade their systems, doing so is time-consuming and difficult. Too frequently lenders look at the newest release from their LOS vendor and think “how do I get there from here?” How should lenders be thinking about bringing their customizations forward into their new release? Previously, many lenders defined the ideal LOS as one that was customized to their way of doing business – what was the most efficient at the time. However, the combination of FinTech, new POS technology, the new ULRA, and the constant pace of change are forcing many lenders to take major system upgrades, and to re-think their LOS customization strategy. Even with some (temporary) regulatory relief, the overall pace of change is speeding up. Many LOS and POS vendors now expect to make a significant release each year, and to continue on that pace, with the requirement that lenders adopt the new releases faster. But that is OK, because the business case for their adoption is growing stronger. Being able to take new releases quickly and easily is the new efficiency. The best strategy is to make your organization (process, technology and people) as adaptable as possible. How does a lender do that? Although here at CC Pace we help lenders with all three aspects, for the sake of this blog, we will focus on just one: the technology, in this case the LOS. 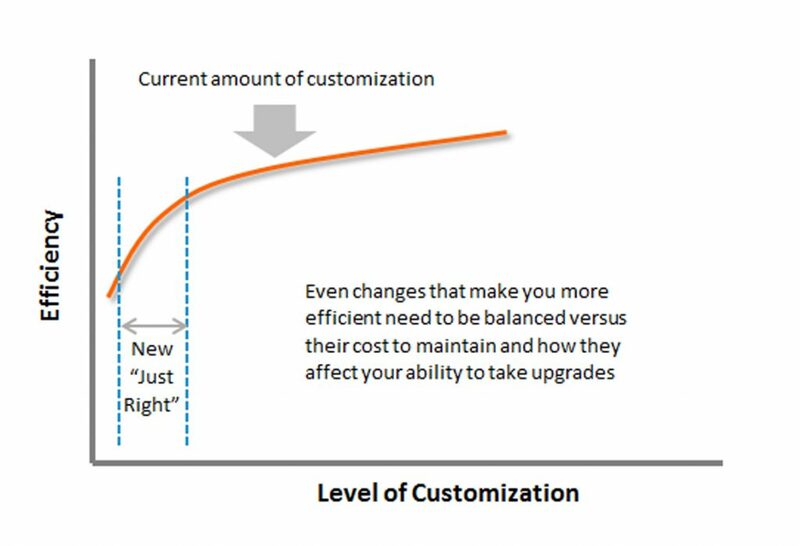 Typically, the hardest part of taking an upgrade is making sure the customizations survive the transition and associated regression testing. Low-level users on the project demand a change without regard for the long-term business case (that includes the cost of making and then maintaining the customization). Sometimes even if the change is better, it might not be worth it. Exception processing – a mature system (which is typically the type being replaced) will likely have grown to handle exceptions. However, I have seen too many cases where people forget that they are processing exceptions – and let “the rules” pass them by. Focus on getting the straight through process to work. There is a continuum between a strict “No Customization” policy at one end, and the previous “We bought this system to be able to customize it, let’s do it” at the other. An organization should strive for “Goldilocks,” that sweet spot where you implement important customizations, but the rational for the change is made by management, after detailed discussions with the vendor, and performed in a way as to have lower maintenance costs. If you are one of these lenders with highly customized systems, what is your upgrade strategy? We only have to take a look around to know that while great strides have been made providing technology and applications to help customers with their everyday lives, there is still a long way to go. I don’t mean until life is fully automated, it is more about the refinement needed to what is in use to fully serve its purpose and the public. Issues customers encounter can be anything from a bifurcated process still needing a combination of personal touch and automation, to technology geared toward some but not all customers, to a limited-scope solution that only addresses part of the customer’s needs (and wants). While the assumption is that it is always quicker to do something online, there are times where that is a fallacy. Many organizations are realizing there is a gap in their offerings and some have created customer experience (CXP) officers or departments to specifically address the customer experience. The goal for CXP is specifically to “delight” the customer by designing interactions that places the customer’s needs first. Allowing a customer to begin a process at the branch, transition to a mobile application to enter their information, and then reach out to the customer support line to continue the process without having to explain their entire situation, re-enter data, or any other duplicative effort would be a nirvana of sort for many organizations. That seamless experience is what organizations strive for but have yet to achieve in the vast majority of cases. That is a world where the tools and information the customer wants and needs are provided, how they want it and when they need it. This foundation will very likely encourage customers to be more independent through self-service transactions, as they will have confidence that they get the answers they need or support they want without wasting time and effort needing duplicative explanations or repetitive data entry. Does your company have a Customer Experience Division? What changes have been introduced due to this group’s activities? We would love to hear from you!